Martin Brodeur (second from left) is joined by Gary Bettman (left), Jayna Hefford, Willie O'Ree, Martin St. Louis and Alexander Yakushev. 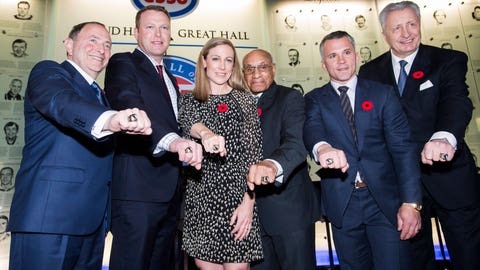 TORONTO — Martin Brodeur, who finished his career with the St. Louis Blues, led the latest group of inductees to the Hockey Hall of Fame on Monday night. Brodeur, the all-time leader in goalie wins and shutouts, was joined in the players category by Martin St. Louis, Canadian women’s star Jayna Hefford and Russian great Alexander Yakushev. Willie O’Ree — the NHL’s first black player — and NHL commissioner Gary Bettman went into the Hall as builders. A three-time Stanley Cup champion and four-time Vezina Trophy winner with the New Jersey Devils, Brodeur won 691 games and had 125 shutouts in his 20 seasons. Three of those wins and one of those shutouts came early in the 2014-15 season with the Blues before he hung up his skates and joined the St. Louis front office. O’Ree became the first black player in the NHL when he was called up by the Boston Bruins to play against the Montreal Canadiens on Jan. 18, 1958. O’Ree, 83, had a long career in the minors and played just 45 games in the NHL, but he returned to the fold in 1996 as a league ambassador. During Bettman’s 25-year tenure, the league has expanded from 24 to 31 teams and annual revenues have ballooned tenfold to around $5 billion.